A content audit is not an easy task to do. It is time-consuming and detailed-oriented. From in-depth analyzation on articles to SEO, a content audit inspects all components of your website. While tedious and—to some, annoying—a content audit delivers substantial benefits to the day-to-day performance of your site’s content. So, as you do a content audit, what do you need to do to determine if the content is valuable to your content strategy? 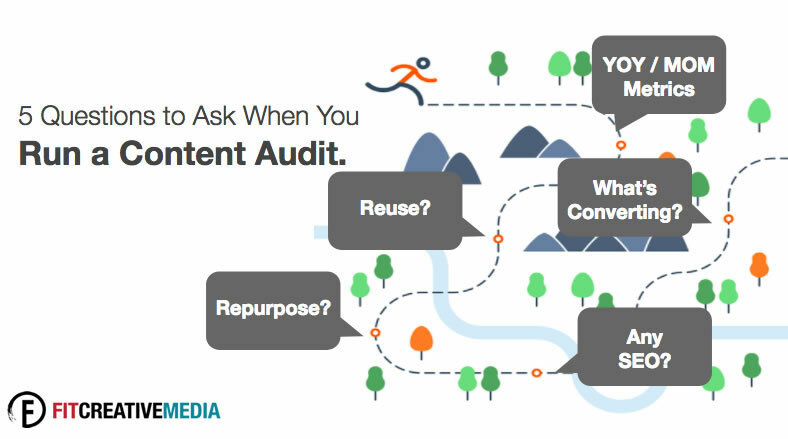 Here are five questions to ask yourself when you run a content audit. What Is the YOY/MOM Metrics? Data is your best friend. Look at how the content has performed year over year and month over month. Dig into the page views, time spent, visitors, unique visitors, exit rate, shares, comments, and conversions. If numbers are consistently up YOY/MOM, then it’s more than likely a valuable piece. You wrote the article with a purpose for your targeted audience. Is This Content Reusable or Timely? Did you cover an event? Does the piece read as an evergreen story? If it’s a timely topic, it’s difficult to reuse the content. But if it’s evergreen, you can note that and ask yourself the next questions. Can I Repurpose This Content Piece? Just because an article is older, doesn’t mean that you can’t repurpose it. The way Google searches for content today is different from five years ago—heck, even a year ago. So, look at your piece and see how you can improve it. Can you break it into a slideshow? Can you add subheads? Can you turn a three-page article into one long page or vice versa? Can you add imagery or links? One minor change can help increase this content piece visibility. You might even be able to turn the article into two brand new articles. SEO has evolved over the years. Five years ago, plugging in SEO in the title and a few times in the article was all that was needed. Again, times have changed. So, first ask yourself if you even used SEO. If you did, did you use it wisely? Can you update the SEO and outperform competitors? Do your SEO research, update it if needed and don’t forget to update the SEO within the article, subheads, and backend. Content supports sales. So, you want to look to see if the content piece drove traffic to a transaction. If not, did you miss out on any opportunities? Is there a call-to-action link or button? Did you write the article with purpose and for your audience? If not, maybe it turned your audience away. Reread the piece to see if it aligns with your business goals, voice, tone, and style. If not, update it. Is the format off? Sometimes articles look clunky and turn the reader away. Make sure it seems clean and professional, so it’s easy for the consumer to read. And, don’t forget to check if it was responsive. Today users read on their phones. If the content isn’t mobile-friendly, then that also might be a reason why the material didn’t convert. Read more: What's the Difference Between Content Marketing and Content Strategy? Newer PostWhy Blog Writing is So Important?